How to Train Your Dragon: The Hidden World is a 2019 American computer-animated action fantasy film loosely based on the book series of the same name by Cressida Cowell, produced by DreamWorks Animation and distributed by Universal Pictures. It is the sequel to How to Train Your Dragon 2 (2014) and the final installment in the How to Train Your Dragon film trilogy. Written and directed by Dean DeBlois, the film stars the voices of Jay Baruchel, America Ferrera, Cate Blanchett, Craig Ferguson, and F. Murray Abraham. The film's plot follows Hiccup seeking a dragon utopia called "The Hidden World" while coming to terms with Toothless' new bond with a female Light Fury. How to Train Your Dragon: The Hidden World was released on January 3, 2019 in Australia, and February 22, 2019 in the United States. It is the first DreamWorks Animation film to be distributed by Universal Pictures, whose parent company NBCUniversal acquired DWA in 2016, rather than 20th Century Fox, with which the studio previously had a distribution deal. It received positive reviews from critics and has grossed over $275 million worldwide, becoming the third highest-grossing film of 2019. One year after defending Berk from Drago Bludvist, Hiccup, Toothless, their dragon rider friends (Astrid, Stormfly, Snotlout, Hookfang, Fishlegs, Meatlug, Ruffnut, Tuffnut ,Barf and Belch) and Hiccup's mum Valka continue to rescue captured dragons in order to bring them back to Berk and create a bustling dragon and human utopia. Unfortunately, their efforts have also resulted in the island becoming severely overpopulated with dragons. In a response to the overcrowding, Hiccup desires to find the "Hidden World", a safe haven for dragons that his late father Stoick told him about. During lunch at the Great Hall at Berk, Gobber pressures Hiccup and Astrid to tie the knot and get married and start ruling Berk as a royal couple which Astrid feels a little awkward. Meanwhile, a White Fury dragon, held captive by warlords, is given to infamous dragon hunter Grimmel the Grisly as bait for him to capture Toothless for the warlords' use as an alpha. Toothless discovers the white Fury (dubbed a "Light Fury" by Astrid) in the woods and the two quickly become enchanted with each other until the Light Fury, sensing Hiccup's nearby presence, flees. Hiccup and Tuffnut later discover Grimmel's dragon traps in the area. Grimmel visits Hiccup that night, revealing that he hunted and killed all the other Night Furies except Toothless, but Hiccup has prepared an ambush to capture him; Grimmel escapes, burning down Hiccup's house and part of Berk, threatening to return if Grimmel doesn't get Toothless soon. In response, Hiccup rallies the citizens and dragons to leave Berk on a quest to find the Hidden World and safety from dragon hunters. Mid-journey, the Berkians discover an island on which they initially plan to rest for a short while, but soon begin to settle there, even if only temporarily. While there, Toothless meets the Light Fury again and, after a few failed attempts, he manages to woo her with a drawing of her in the sand. Seeing Toothless's inability to fly solo hindering his growing relationship with the Light Fury, Hiccup rebuilds an automatic, fireproof tail for him. Upon receiving the tail, Toothless flies off, meeting the Light Fury on his own and flying with her to an unknown land. Valka, on a scouting patrol, notices Grimmel's approaching army and quickly reports back to Hiccup. Hiccup and the dragon riders head to capture Grimmel; yet, they fall into his trap and barely escape. Ruffnut is captured but irritates Grimmel until he releases and secretly follows her after she unknowingly revealed the Berkians' new location. Hiccup and Astrid, searching for Toothless, find the Hidden World and see Toothless and the Light Fury leading the dragons there as king and queen. When the two are soon discovered, Toothless rescues Hiccup and Astrid and returns them to the Berkians, with Hiccup realizing his people would be intruders and unsafe in the Hidden World. Suddenly, Grimmel appears and captures Toothless and the Light Fury (who followed Toothless). Toothless's alpha status allows Grimmel to capture the rest of Berk's dragons by threatening to kill the Light Fury if any dragon or Berkian attacks. With Astrid's encouragement, Hiccup sets out with the dragon riders to stop Grimmel and his army. Gliding on wingsuits, they catch Grimmel's army off-guard, igniting a battle. Hiccup frees Toothless, while Grimmel drugs the Light Fury into obeying him. Hiccup and Toothless give chase, but Grimmel tranquilizes Toothless midair causing the dragon to fall helplessly. Hiccup, realizing he cannot rescue Toothless alone, frees the Light Fury and implores her to save Toothless. Hiccup is fully prepared to sacrifice himself in order to save Toothless as both he and Grimmel plummet toward the sea. The Light Fury, however, returns to save Hiccup as well while Grimmel hits the water and drowns. Back on the island, both Toothless and Hiccup fully realize that dragons will never be safe in the human world. Hiccup bids a tearful farewell to Toothless as all of the Berkians set their dragons free to live in the Hidden World. Toothless brings all the dragons to his command for one last time as the Light Fury leads him and the rest of the dragons away to their new home. Sometime later, Hiccup and Astrid marry on the island on which the Berkians have settled. A few years into the future, Hiccup, Astrid, and their two children sail across the sea to reunite with the dragons at the edge of the Hidden World. There Toothless and the Light Fury are shown to have mated and have given birth to three hybrid dragon fledglings. After introducing his children to his old friend, Hiccup takes their son flying on Toothless while Astrid and their daughter fly on Stormfly, accompanied by the Light Fury and their offspring. Hiccup vows that, until the time comes when humankind and dragons can co-exist peacefully, the Berkians will guard the secret of the dragons' disappearance. A.J. Kane voices a younger Hiccup. America Ferrera as Astrid, an excellent fighter, she is Hiccup's betrothed fiancée and later wife. F. Murray Abraham as Grimmel, an infamous dragon hunter who is hired by the Warlords. Cate Blanchett as Valka, A dragon rescuer and Hiccup's mother, now living on Berk after twenty years of isolation. Gerard Butler as Stoick the Vast, the late father of Hiccup. Craig Ferguson as Gobber the Belch, a seasoned warrior, blacksmith and dragon dentist . Jonah Hill as Snotlout Jorgenson, a brash, overconfident, and fairly unintelligent, but a reliable friend of Hiccup. Christopher Mintz-Plasse as Fishlegs Ingerman, an enthusiastic friend of Hiccup knowledgeable in dragon lore which he often relates in a role-playing game style. Kristen Wiig and Justin Rupple as Ruffnut and Tuffnut Thorston, fraternal twins who are friends with Hiccup. Kit Harington as Eret, a former dragon hunter who used to work for Drago Bludvist who has joined the dragon riders after the events of the second film. Julia Emelin as Griselda the Grievous, an aggressive warlord who works for Grimmel. Ólafur Darri Ólafsson as Ragnar the Rock, an incompetent warlord who works for Grimmel. James Sie as Chaghatai Khan, a less aggressive and stubborn warlord who works for Grimmel. David Tennant as Ivar the Whitless, a dragon trapper who works for the Warlords. Tennant also voices Spitelout Jorgenson, the father of Snotlout. Robin Atkin Downes as Ack, a blond-bearded viking. Kieran Elliot as Hoark, a viking with a knotted beard. Ashley Jensen as Phlema, a female viking who works as a botanist at the School of Dragons. In December 2010, DreamWorks Animation CEO Jeffrey Katzenberg announced that there would also be a third film in the series: "How To Train Your Dragon is at least three: maybe more, but we know there are at least three chapters to that story." Dean DeBlois, the writer and director of the second and the third film, said that How to Train Your Dragon 2 is being intentionally designed as the second act of the trilogy: "There are certain characters and situations that come into play in the second film that will become much more crucial to the story by the third." DeBlois said in an interview that the third part will be released in 2016. Although the series has taken a different path of telling a story of Hiccup and Vikings, Cressida Cowell has revealed that the trilogy and the book series will have similar endings (with "an explanation as to why dragons are no more"). The film is produced by Bonnie Arnold and Brad Lewis. DeBlois and Chris Sanders are the executive producers; Saunders was an executive producer of the second film and co-director of the first. Jay Baruchel, Gerard Butler, Craig Ferguson, America Ferrera, Jonah Hill, Christopher Mintz-Plasse and Kristen Wiig returned in the third film, with Justin Rupple replacing T.J. Miller as Tuffnut. DeBlois revealed that Miller did initially return to voice Tuffnut, but Dreamworks recasted him after the actor's sexual assault allegations and arrest for calling in a fake bomb threat. Cate Blanchett also reprised her role as Valka from the second film. On November 14, 2017, it was announced that Kit Harington will reprise his role as Eret and F. Murray Abraham has joined the cast. During the earlier stages of production, DeBlois stated that Djimon Hounsou would also return as Drago Bludvist. It was even planned to have Drago redeemed by the film's end, but halfway through development, DreamWorks co-founder Steven Spielberg convinced DeBlois that the story of Drago's redemption required more screen time that they could not provide, causing his inclusion to be scrapped. On April 17, 2018, DreamWorks Animation announced that the sequel's title would be entitled How to Train Your Dragon: The Hidden World. John Powell, who composed the previous two films, returned to compose the film's score. In addition, Powell's collaborators Batu Sener, Anthony Willis, and Paul Mounsey are credited as additional composers. Also returning from the previous films, Jónsi wrote a new song for the film, titled "Together From Afar", which was released as a single in January 31, 2019. Jónsi also provided vocals for a track titled "The Hidden World". In September 2012, 20th Century Fox, the studio's then-distributor partner, and DreamWorks Animation announced the film was originally going to be released on June 17, 2016. In September 2014, the film's release date was pushed back a year from its original release date of June 17, 2016 to June 9, 2017. DeBlois explained the release date shifts as such: "It's just that these movies take three years. I think it was a little ambitious to say 2016... As is normally the case, they kind of throw darts out into the future and wherever they land they call that a release date until we start talking about it in practical terms, and then it's like, 'Uh yeah that's not enough time'. So knowing that they take three years from this moment, from outlining and writing the screenplay through to the final lighting of it, it's just a process of building models and doing tests and animating, storyboarding, the whole thing just adds up to about three years." In January 2015, the release date was pushed back a year from June 9, 2017 to June 29, 2018 following DreamWorks Animation's corporate restructuring and lay-offs meant to maximize the company's "creative talent and resources, reduce costs, and drive profitability." On June 18, 2016, the release date was moved up from June 29, 2018 to May 18, 2018, taking the release date of the Warner Animation Group's The Lego Movie 2: The Second Part. On December 5, 2016, the US release date was pushed back from May 18, 2018 to March 1, 2019. The release date was moved up for a final time from March 1, 2019 to February 22, 2019, taking the slot of The Turning, a live-action DreamWorks film which in turn was pushed back to January 24, 2020. The movie's poster was released on May 31, 2018. Its first trailer premiered on June 7, 2018, while its second trailer was released on October 25, 2018. As of February 24, 2019[update], How to Train Your Dragon: The Hidden World has grossed $57.5 million in the United States and Canada, and $217.5 million in other territories, for a worldwide gross of $275 million, against a production budget of $129 million. 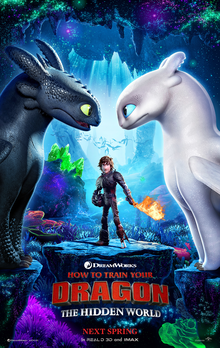 In the United States and Canada, How to Train Your Dragon: The Hidden World held early screenings at 1,000 theaters on February 2, 2019 and grossed $2.5 million, one of the highest advance showing totals ever. It was released alongside the wide expansion of Fighting with My Family, and was initially projected to gross $40–45 million from 4,259 theaters in its opening weekend. After making $17.5 million on its first day (including $3 million from Thursday night previews), weekend projections were increased to $60 million. The film grossed $1.5 million on its opening day in Australia, setting a record for a DreamWorks Animation film in that country (surpassing Shrek 2). In New Zealand, the film grossed $173,000 on its opening day, ranking as DreamWorks Animation's second biggest opening day in the country, behind Shrek 2. By its third weekend of international release the film has grossed a total of $41 million, with the largest markets being Australia ($14.4 million), Brazil ($4.5 million) and Indonesia ($4.1 million). On review aggregator Rotten Tomatoes, the film holds an approval rating of 92% based on 187 reviews, and an average rating of 7.15/10. The website's critical consensus reads, "The rare trilogy capper that really works, How to Train Your Dragon: The Hidden World brings its saga to a visually dazzling and emotionally affecting conclusion." On Metacritic, the film has a weighted average score of 71 out of 100, based on 34 critics, indicating "generally favorable reviews". Audiences polled by CinemaScore gave the film an average grade of "A" on an A+ to F scale (the same score earned by the first two films), while those at PostTrak gave the film a 90% positive score and a 77% "definite recommend". 1 2 "Film releases". Variety Insight. Retrieved June 5, 2017. ↑ "How to Train Your Dragon: The Hidden World". Universal Pictures. Retrieved 2018-12-31. ↑ "Show times". Event Cinemas. Retrieved December 30, 2018. 1 2 3 "How to Train Your Dragon: The Hidden World (2019)". Box Office Mojo. Retrieved February 25, 2019. ↑ Alexander, Bryan (June 7, 2018). "Toothless is in love! New trailer, photos from How to Train Your Dragon 3". Retrieved June 7, 2018. ↑ "How to Train Your Dragon: The Hidden World". Universal Pictures. Retrieved January 31, 2019. ↑ D'Alessandro, Anthony (October 19, 2016). "How To Train Your Dragon 3 & Larrikins Move from Fox to Uni Release Schedule". Deadline. Retrieved October 20, 2016. ↑ DeBlois, Dean. "I'm Dean DeBlois, director of the How To Train Your Dragon movies, and can't wait for you to see our third movie this March". Retrieved 24 January 2019. 1 2 3 4 5 "How to Train Your Dragon 3 Pushed Back to 2017". ComingSoon.net. September 2, 2014. Retrieved September 2, 2014. 1 2 3 "F. Murray Abraham To Get Evil for DreamWorks Animation's How to Train Your Dragon 3". Deadline.com. November 2017. ↑ "How to Train Your Dragon 3 Is the Best One Yet, Says Gerard Butler". Screen Rant. Retrieved June 6, 2018. 1 2 3 4 "How to Train Your Dragon 3 (2019) News & Info". Screen Rant. Retrieved December 28, 2017. 1 2 Abele, Robert. "'How to Train Your Dragon: The Hidden World' Film Review: Third Time's a Fire-Breathing Charm". The Wrap. Retrieved 2 January 2019. ↑ Debruge, Peter (January 2, 2019). "Film Review: 'How to Train Your Dragon: The Hidden World='". Variety. ↑ O'Hara, Helen (December 3, 2010). "Katzenberg Talks DreamWorks Sequels". Empire. Retrieved September 7, 2011. ↑ Giardina, Carolyn (June 2, 2011). "Storyboarding Has Begun on How to Train Your Dragon Sequel". The Hollywood Reporter. Retrieved September 12, 2011. ↑ Rao, Priya (April 5, 2012). "THIS WEEK IN TORONTO — PART 3". First Weekend Club. Retrieved October 21, 2013. ↑ Neish, Steven (August 14, 2012). "Author Cressida Cowell Talks How To Train Your Dragon Sequels". Hey U Guys. Retrieved August 27, 2012. 1 2 3 4 "New Distributor Twentieth Century Fox Unveils DreamWorks Animation's Release Slate Through 2016". DreamWorks Animation. September 9, 2012. Retrieved October 5, 2014 – via PR Newswire. ↑ Renfro, Kim. "'How to Train Your Dragon: The Hidden World' director says T.J. Miller's removal from the movie wasn't his decision: 'I didn't have a lot of say in the matter'". Insider.com. Retrieved 25 February 2019. ↑ Chitwood, Adam (February 5, 2015). "Director Dean DeBlois Talks How to Train Your Dragon 3 at VES Awards". Collider. Retrieved February 5, 2015. ↑ Lang, Brent (April 17, 2018). "How to Train Your Dragon 3: Title Announced". Variety. ↑ White, James. "How to Train Your Dragon 3 Is The Hidden World". Empire. Retrieved 2018-04-18. ↑ Chitwood, Adam. "Composer John Powell Talks How to Train Your Dragon 2, the State of Film Scoring Today, His Career, Taking a Break, Hans Zimmer, and More". Collider. Retrieved June 13, 2014. ↑ "Together from Afar (How to Train Your Dragon: The Hidden World)". YouTube. Retrieved 3 February 2019. ↑ McClintock, Pamela (June 13, 2013). "'Monsters,' 'Despicable Me 2,' 'Turbo': Summer's Brutal Animation War". The Hollywood Reporter. Retrieved August 20, 2013. ↑ "Upcoming Releases". DreamWorks Animation. Retrieved August 21, 2012. ↑ Chitwood, Adam (October 17, 2014). "Dean DeBlois Talks How to Train Your Dragon 3 and Potential Spinoffs; Says He's Talked Jeffrey Katzenberg Down from the Idea of Dragon 4". Collider.com. Retrieved October 23, 2014. ↑ Maas, Jennifer (January 22, 2015). "DreamWorks Animation cuts back to two films a year, delays How to Train Your Dragon 3". Entertainment Weekly. Retrieved January 22, 2015. ↑ Graser, Marc (January 22, 2015). "Jeffrey Katzenberg on DWA's Cutbacks: '3 Films a Year Was Too Ambitious'". Variety. Retrieved January 22, 2015. ↑ Schaefer, Sandy (June 19, 2016). "How to Train Your Dragon 3 Takes LEGO Movie 2's Old Release Date". Screen Rant. Retrieved December 23, 2016. ↑ D'Alessandro, Anthony (December 5, 2016). "How to Train Your Dragon 3 Flies to 2019; Uni's DWA to Scale 'Everest'". Deadline. Retrieved December 23, 2016. ↑ Hermanns, Grant (September 27, 2018). "How To Train Your Dragon 3 bumped up a week". ComingSoon.net. Retrieved October 2, 2018. ↑ D'Alessandro, Anthony (February 1, 2019). "Universal Dates Judd Apatow-Pete Davidson Comedy & DreamWorks' 'The Turning' For 2020". Deadline Hollywood. Retrieved February 1, 2019. ↑ DreamWorks Animation [@DWAnimation] (31 May 2018). "In One Week, see the trailer for How to Train Your Dragon: The Hidden World. #HowToTrainYourDragon" (Tweet). Retrieved June 6, 2018 – via Twitter. ↑ D'Alessandro, Anthony (February 3, 2018). "'How To Train Your Dragon: The Hidden World' Saturday Previews On Fire With $2.5M, Besting 'Jumanji 2' & 'Hotel Transylvania 3'". Deadline Hollywood. Retrieved February 3, 2019. 1 2 D'Alessandro, Anthony (February 23, 2018). "'How To Train Your Dragon: The Hidden World' Heading Toward $60M Franchise Record Opening". Deadline Hollywood. Retrieved February 23, 2019. ↑ D'Alessandro, Anthony (January 31, 2018). "'How To Train Your Dragon: The Hidden World' To Hatch $40M-$45M Opening". Deadline Hollywood. Retrieved January 31, 2019. ↑ "How to Train Your Dragon: The Hidden World (2019)". Rotten Tomatoes. Retrieved February 25, 2019. ↑ "How to Train Your Dragon: The Hidden World reviews". Metacritic. Retrieved February 25, 2019.